Jam Session Standards: Not a beginner but want to check out learning by ear? Start here! All songs explained note-by-note. 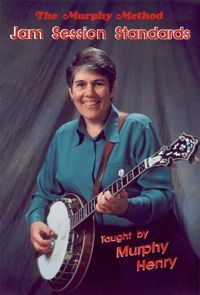 Also great for Murphy Method students who have completed the Big Three (Beginning Banjo Vol. 1 and 2 and Misfits) and are ready to move on to something slightly harder. And finally, a way to answer all those requests for “Rocky Top”! These songs are considered bluegrass standards almost everywhere. No Tab. Roll in My Sweet Baby’s Arms, Salty Dog, Mountain Dew, Dueling Banjos, Rocky Top.